These procedures are typically broken down into a few categories. Here in this section of our site we’ll outline the most common procedures and address when and why many of these procedures are necessary. First off, what is a root canal and what is the cost of a root canal? In many cases, a tooth is in visibly great shape, but the tooth has decay or a cavity within the middle of the tooth. The tooth can be saved, but the root canal procedure must be performed, where the tooth’s nerve and pulp are removed, along with all of the decay and infection. The tooth is then permanently sealed after it is first cleaned. The tooth’s pulp needs to be removed primarily because once infection initially begins, it degenerates quickly, breaking down and causing significant infection and pain. Dentures, what some would call false teeth, have been a solution for missing teeth for generations. While there are many solutions for injury, sometimes dentures are the only option available to a patient. Whether someone is missing all or several teeth, caused from injury, tooth decay or any other form of oral disease, partial or full dentures are a genuine solution. Depending on the overall solution a patient decides on, costs will vary. 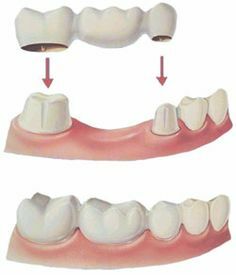 Conventional – In this case, all remaining teeth are taken out of the mouth, the mouth goes through a healing process, which can take many weeks, then a full and 100% removable denture is put in the mouth. In this case, the denture is not permanently affixed and will remain removable forever, adhering to the patients’ gums. This is the most common solution and costs less than those that chose implants. Overdenture – This procedure involves the use of denture implants as a foundation where specific teeth can be salvaged. The implant dentures are anchored into the jaw bone, providing stability for the denture device. Significant advancements in both technology and procedure have enabled people to save many of their teeth by opting for this type of solution. Immediate – When a patients teeth are removed to prepare their mouth for a full, or conventional denture, an immediate denture is fitted while the patients’ mouth heals. This enables the patient to have teeth during this healing process. 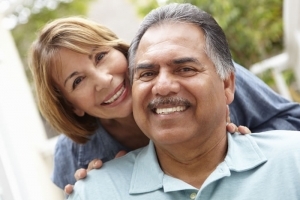 If a patient experiences any type of sizing problems, or there is damage to the unit, a denture repair clinic can solve these problems quickly and generally quite affordably. When a patient has a tooth that can be salvaged, but where there is cosmetic damage, the typical procedure used is to place a dental crown, or tooth cap over the tooth. This crown will protect the tooth from further decay or damage, while also providing an aesthetically pleasing appearance of the tooth. The cost of dental crown solutions have come down dramatically over the past several years as stronger and much less expensive materials have been made available. 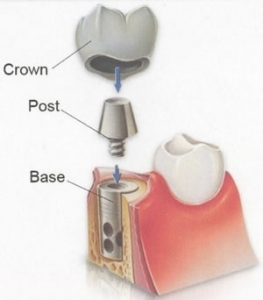 While it used to be very common for dentists to some form of metal alloy for crowns and caps, it has become much more affordable, as well as a better long-term solution to use All-Resin dental crowns. Sure, for periods of time in the past, having gold teeth was something of a status symbol. Those days seem to be gone, as more folks prefer to have teeth that are all the same color. Dental crowns cost has been significantly decreased by using this All-Resin solution, much less than the all-ceramic or all-porcelain solutions. Teeth crowns are a fantastic solution where a tooth can be saved, preventing the patient from having to engage in a form of implant or even a denture. While restorative solutions are not necessarily a form of cosmetic dentistry, patients have become a lot more aware of the way their mouths look and the choices that are available to them as they choose the solution for their crown or cap. When gingivitis or decay create tooth loss, many people opt for an implant to replace the lost tooth. Dental implants replace the root of the tooth with pieces of metal that anchor into the jaw bone and enable the patient to restore their smile and overall oral health. There are significant advantages for the patient to engage the use of tooth implants over other solutions, while providing both added comfort and improved appearance for the patient. To undergo a dental implant, the patient needs to be healthy, otherwise, as with any type of surgery, there could be unnecessary complications. Heavy smokers and those suffering from diabetes need to be evaluated on a case by case basis. While dental insurance typically not cover most forms of implants, tooth implant cost is a little more than other type of dental procedures. If the tooth loss was due to an injury, many patients are able to get their medical insurance plan to cover these costs. In most cases, tooth extraction is generally a last resort for a dentist. If at all possible, most dentists will look to fill, cap, or restore a tooth. However, if there is too much tooth decay, or if the tooth has been broken in such a way that repair is impossible, the only option is for the removal of the tooth. How to pull a tooth from your mouth will depend entirely on where the tooth is located in your mouth as well as if the tooth is impacted or not. In many cases with wisdom teeth removal, it is often necessary to cut away gum and sometimes bone tissue to access the impacted teeth. Look, we recognize that any of these restorative dental procedures make most of us a bit uncomfortable. However, with today’s technological and procedural advancements, we aim to make all of our patients comfortable and confident. We encourage you to browse our site and then click on the About Us section to schedule an initial consultation so we can sit down and identify exactly how we can assist you and your oral health needs. We look forward to meeting with you. No matter the issue, you can count on us to help make the best decision for you. Schedule an appointment now!